I use this spreadsheets for taking content inventories – a task often done toward the beginning of an information architecture project, and essential for any website or intranet content migration project. 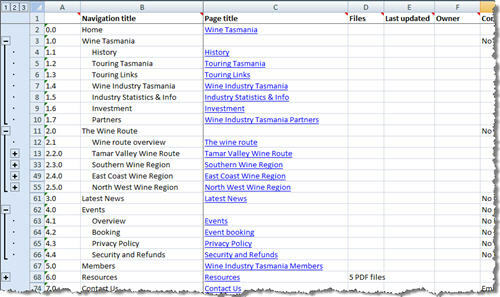 The spreadsheet stores information about each ‘page’ on the website. It is a very handy tool as it allows you to get an understanding of all the content on your website, and see it all at a glance. Before taking a content inventory, think about what you need to get out of it and what you may use it for in your projects. Think about what information you may need to collect, and only collect that – don’t collect more than you might need – it is just a waste of time and effort. If you are lucky, your content management system may already have a listing of file. If you are unlucky, you may have to click through the site page by page. The spreadsheet contains instructions for what to include in each column and a set of tips for how to go about filling in the spreadsheet. The main point to remember is that this is a tool for you to use for your project. You should collect whatever will help you best and represent the information however suits you. The spreadsheet is only a guide.